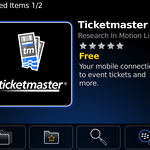 There have long been third-party programs for the BlackBerry, but in light of Apple’s enormous success with an easy, built-in App Store for the iPhone, Research in Motion today unveiled its own similar store, called BlackBerry App World. 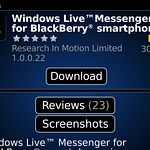 The store has hundreds of apps available at launch, and RIM says it expects around a thousand to be available in its first week. 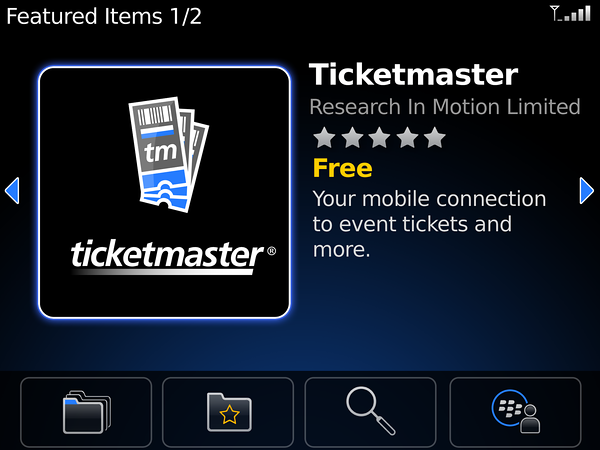 Like Apple’s store, RIM’s offers both free and paid apps that download directly to your device. 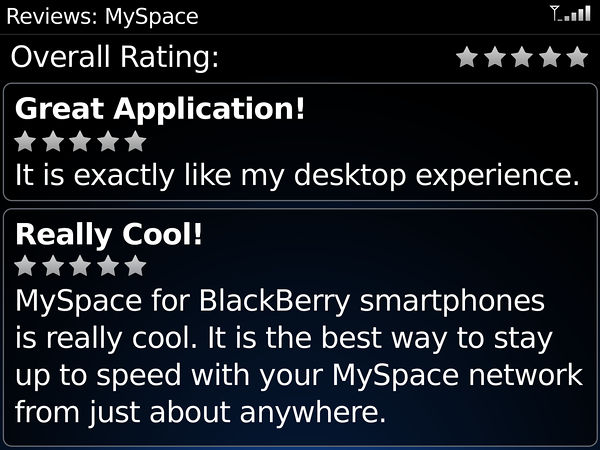 I haven’t had time to do a full review of App World, but I tried it out for a couple of hours on a top-of-the-line BlackBerry Bold and a fast network connection. Here are my first impressions. 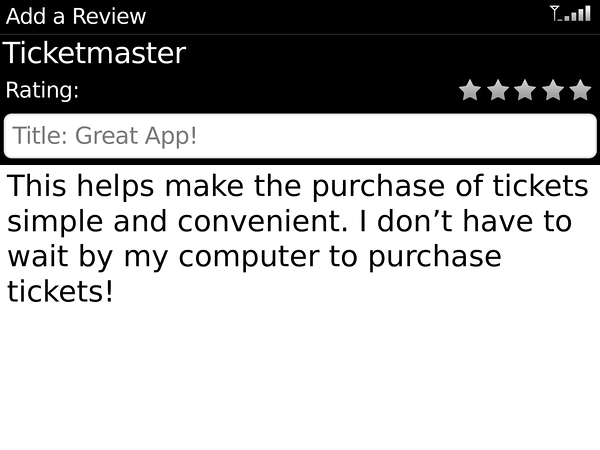 RIM’s store is clumsier to use than Apple’s (AAPL), but it works. The selection at launch is decent, but with some surprising omissions. 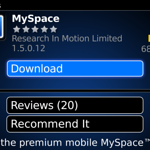 The emphasis seems, at first glance, to be toward pricier apps. And, there are some limitations and oddities. Perhaps the biggest of these is that App World is only available for relatively recent BlackBerry models–the ones with trackballs instead of side wheels, starting with the Pearl, which came out in the fall of 2006. That means that millions of people with older models can’t use the app store. 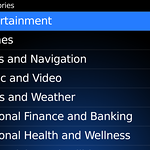 App World has apps in all the major categories–Games, Productivity, Entertainment, News, Weather, Finance, Health, Social Networking, and so forth. The selection is broad. 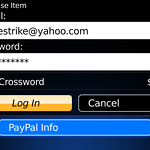 For instance, on the first day, it offers 166 games, 99 productivity and utility apps, and 69 reference and book apps. There are even a few of those fart apps that have proved so popular on the iPhone, something that seems so… unBlackBerry-like. But there are some surprising omissions. There’s no dedicated Twitter client, at least none that either I or a RIM (RIMM) spokeswoman could find at this writing. 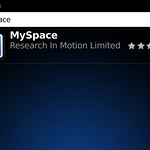 There’s a Facebook app, but it’s the same rudimentary one RIM has offered for a long time. 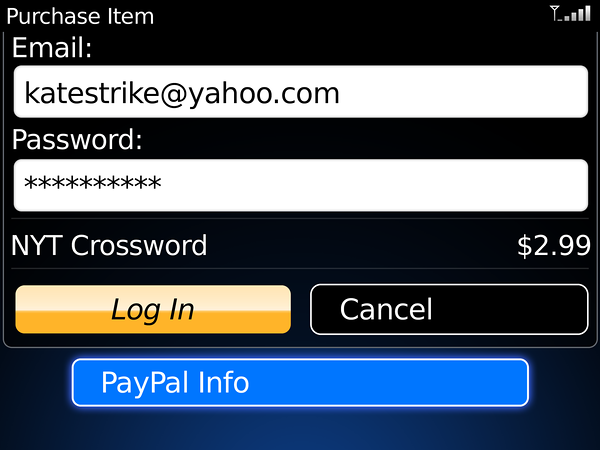 There’s no Google (GOOG) app, just a shortcut to a Google page in the BlackBerry’s browser. And there’s no app for shopping at Amazon (AMZN) or viewing Kindle books. No doubt these things will show up eventually, but given the competition and the time RIM has spent getting this ready, I was surprised they weren’t there at launch. 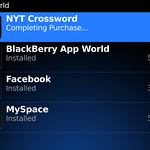 Still, I downloaded about a dozen apps and liked most of them, including the Bloomberg, Pandora, and Shazam apps. But a $2.99 Associated Press app didn’t work properly and looked crude compared with the free AP app on the iPhone. Shazam, which identifies songs playing nearby and gives you a chance to buy them, correctly identified several songs on the BlackBerry, but unlike on the iPhone, didn’t link to videos related to the songs. The buying process is harder than on the iPhone. 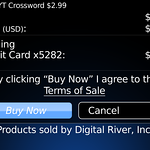 You have to download the store itself, then pay for any apps you want with PayPal, which requires going through a couple of screens each time. On several occasions, despite my fast, strong, steady network connection, app downloads stopped in midstream multiple times, And the least expensive apps are $2.99, about triple the cost of the cheapest typical paid apps on the iPhone. 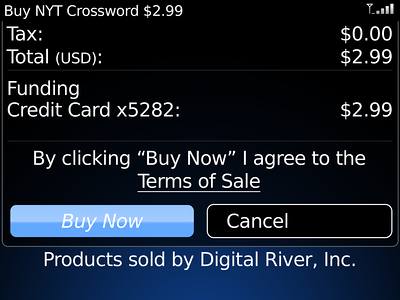 Indeed, I spotted a surprising number of $20, $30 and $40 apps on App World. 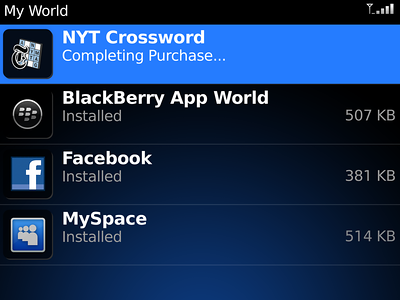 App World has other limitations and oddities. 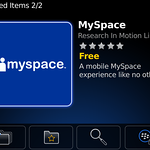 You can only save apps to the BlackBerry’s limited internal memory, not to a roomier flash memory card. 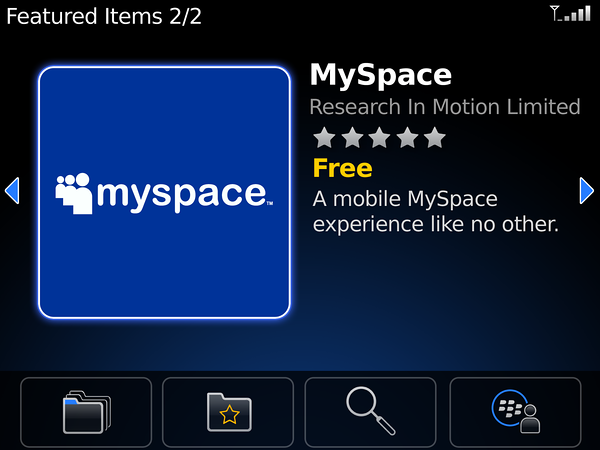 RIM has made up for this by allowing you to also store your apps online, but that’s still a pain, especially when you’re not connected. 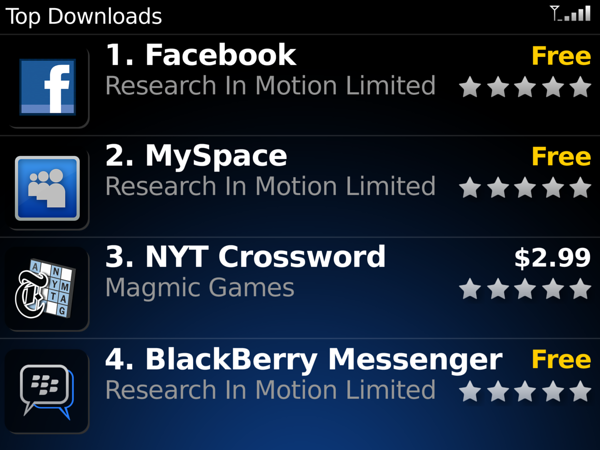 And, oddly, the apps you obtain from App World aren’t located in the BlackBerry’s Applications folder, but in the Downloads folder. You can, of course, move them around, even placing them right on the home screen. BlackBerry fans unfamiliar with the iPhone won’t care about some of these comparisons, of course. They will, and should, just be happy that their phones are now much richer and more versatile devices. And, in the end, that’s what counts. 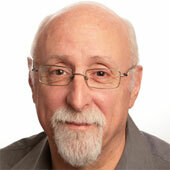 RIM is now truly in the platform game, which will make its products more attractive and could make its shareholders richer. 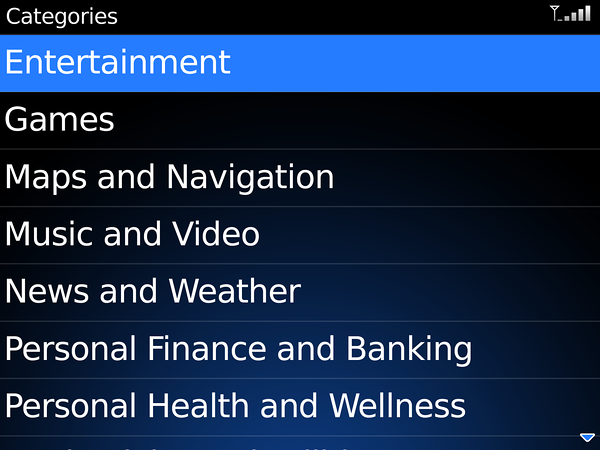 Categories of applications in the BlackBerry App World. 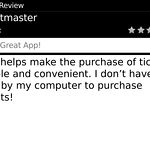 The TicketMaster application for BlackBerry from App World. 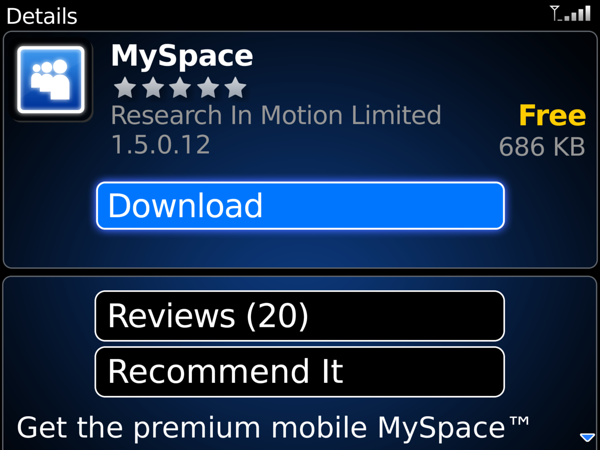 Downloading the MySpace application for BlackBerry. 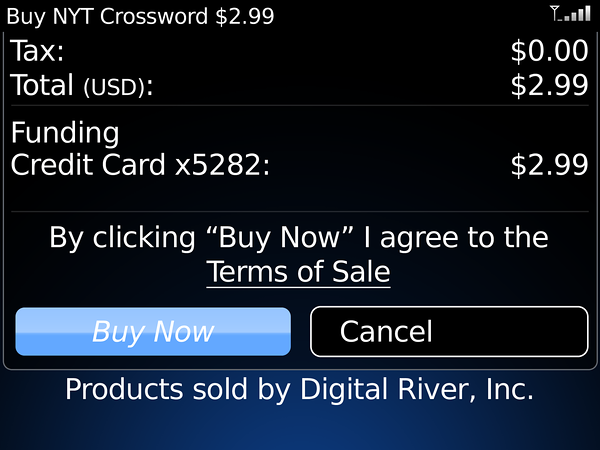 Purchasing an item through the BlackBerry App World. 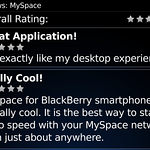 Ratings of the MySpace BlackBerry application. 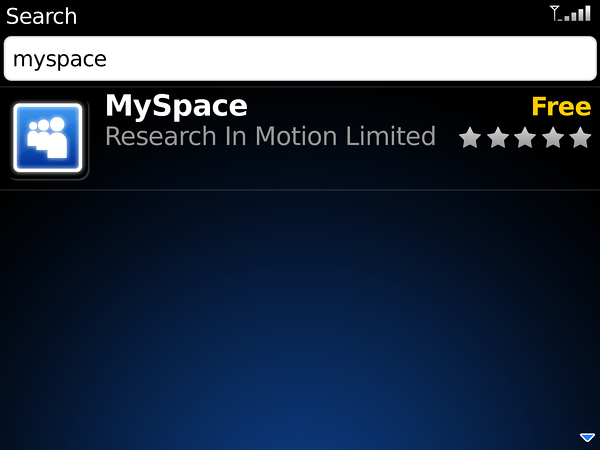 Searching for applications in the BlackBerry App World store. 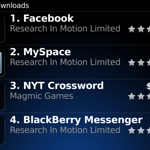 Top downloads from the BlackBerry App World store. 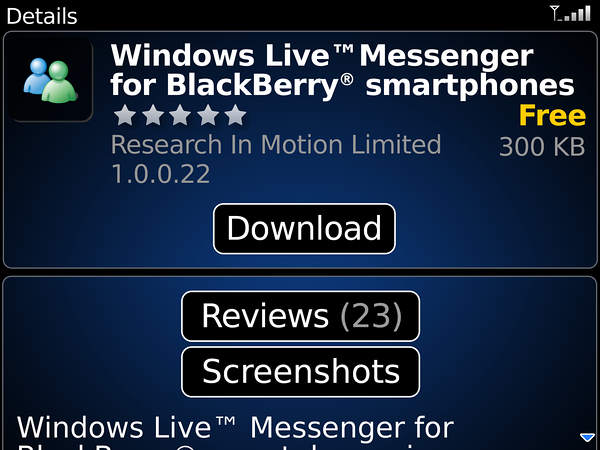 Windows Live Messenger for BlackBerry. Leaving a review of an application. 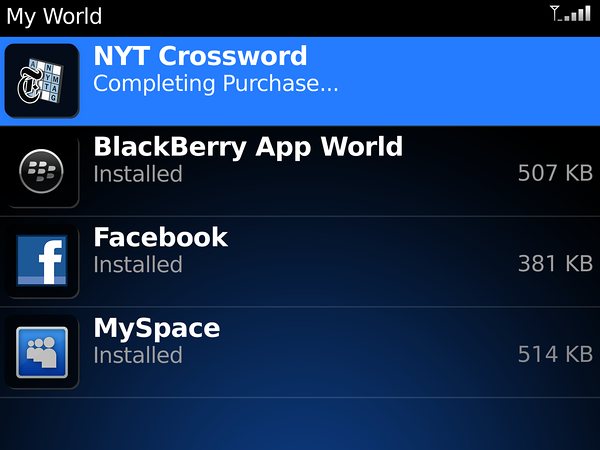 Purchasing the NYT Crossword application from the BlackBerry App Word store.